No. 1044 is a 2000°F (1093°C), inert atmosphere bench furnace from Grieve, currently used for heat treating at the customer’s facility. Workspace dimensions of this furnace measure 12” W x 18” D x 8” H. 6KW are installed in nickel chrome wire coils supported by ceramic plates. 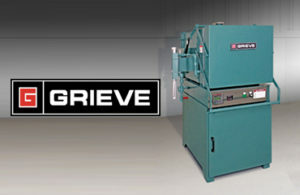 This Grieve bench furnace features 5” thick insulated walls comprised of 1” of 2600°F ceramic fiber and 1” of 2300°F ceramic fiber and 3” of 1900°F block insulation. Features include a vertical lift door with gas spring counter balance and inert atmosphere construction, including a continuously welded outer shell, high temperature door gasket, sealed heater terminal boxes, inert atmosphere inlet and inert atmosphere outlet. Additional features include an inert atmosphere flow meter and normally closed solenoid valve on atmosphere inlet. Controls on the No. 1044 include a digital programming temperature controller and manual reset excess temperature controller with separate contactors.